"For twenty years, I have been listening to and reading innumerable accounts of near-death experiences, but I have rarely encountered one as powerful as Howard Storm's." - Dr. Kenneth Ring, author of Heading Toward Omega and Lessons from the Light. 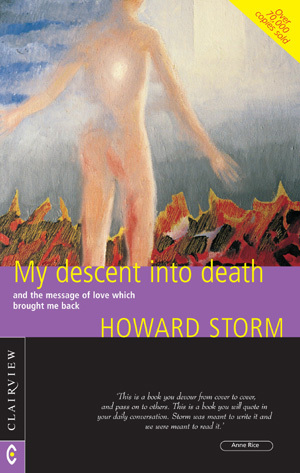 "...I consider Howard Storm's near death experience one of the greatest that I am aware of... I highly recommend this book." - George Ritchie, author of Return from Tomorrow and Ordered to Return. For years Howard Storm lived the American dream. He had a fine home, a family, and a successful career as an Art Professor and painter. Then, without warning, he found himself in hospital in excruciating pain, awaiting an emergency operation. He realised with horror that his death was a real possibility, but as an atheist he was convinced that his demise would mark the end of consciousness. Storm was totally unprepared for what was to happen next. He found himself out of his body, staring at his own physical form. But this was no hallucination; he was fully aware and felt more alive than ever before. In his spirit form, Storm was drawn into fearsome realms of darkness and death, where he experienced the terrible consequences of a life of selfishness and materialism. However, his journey also took him into regions of light where he conversed with angelic beings and the Lord of Light Himself, who sent him back to live on earth with a message of love. My Descent into Death is Howard Storm's full story: from his near death experience in Paris to his full recovery back home in the States, and the subsequent transformation of his life. Storm also communicates what he learned in his conversations with heavenly spiritual beings, revealing how the world will be in the future, the real meaning of life, what happens when we die, the role of angels, and much more. What he has to say will challenge those who believe that human awareness ends with death.